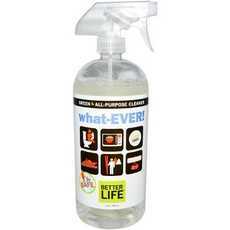 Enjoy Lifestride Better Life What Ever All Purpose Cleaner Scent Free. Surfaces: Use This Safe Cleaner On Any Washable Non-Porous Surface, Including: Countertops, Appliances, Sinks, Toilets, Walls, Baseboards, Floors, Tables, Chairs, Showers And Tubs. Directions:Turn Nozzle To 'On' Position. Aim And Spray. Wipe With A Cloth, Sponge, Old Shirt, Or That Odd Sock That Lost Its Mate (Note: Description is informational only. Please refer to ingredients label on product prior to use and address any health questions to your Health Professional prior to use.